Fires in Western Australia this week have killed four people after catastrophic fire conditions in the region near Esperance. All the victims reportedly died in vehicles. This fire season is shaping up to one of the of the most serious in a long time, after an exceptionally dry and warm spring, amid a strong El Niño and a cool southern Indian Ocean that is choking off rain-bearing westerly winds. Much of eastern Australia from Queensland to Tasmania, and much of Western Australia, is facing above normal fire risk. Australians are still underprepared for bushfires. And with fire seasons getting longer thanks to climate change we need to look at why people are still dying in fires, and what you can do to get prepared. Each Australian state fire service issues its own bushfire planning guide. These are all based on a national policy to "prepare, act, survive". Last week the Tasmanian Fire Service released and updated plan for the current fire season. Plans such as these are critical to help people avoid serious injury and possible death, and to protect homes and businesses from destruction. However, one troubling message from these plans is that many communities in bushland settings across southern Australia are primed for disaster because they do not meet the basic levels of preparedness. Let me explain why. getting individuals to predetermine a well thought-through trigger as to when they should leave an area because of bushfire threat. The reason these concepts are related is because the state of preparedness of your home affects when you need to evacuate. Each state has slightly different interpretations of the national policy, so be sure to check your local guide: Western Australia, South Australia, Victoria, New South Wales, Queensland, Australian Capital Territory, and Northern Territory. For example, in Tasmania on flat land in grassland areas it is recommended that a house should be surrounded by a 10-metre buffer where there are no flammable materials. By contrast, a house in a forest area on flat land in Tasmania is recommended to have a 20 m non-flammable buffer, surrounded by a further 15 m of well-maintained parkland, making a combined area about that of a typical suburban house block. Terrain also matters. On steep terrain (greater than 20 degree slope) in forest a home in Tasmania is recommended to have a 40 m edge of non-flammable materials surrounded by 50 m of parkland, which combined make up an area of about 0.8 hectares. To enable fire-fighting vehicles to access the property, a wide, well-maintained access road with a turning circle suitable for a truck is also required. Without this, the Tasmanian Fire Service will not attempt to defend a property given the risk to fire fighters. An inspection of Google Earth makes it obvious that that many homes in southern Australia, including large areas of the suburban-rural interface such as the suburbs surrounding Hobart, have grossly inadequate defensible space and are thus at high risk from bushfires. Also concerning is that many older homes in southern Australia lack features such as guards to stop embers entering buildings via small cracks and vents. 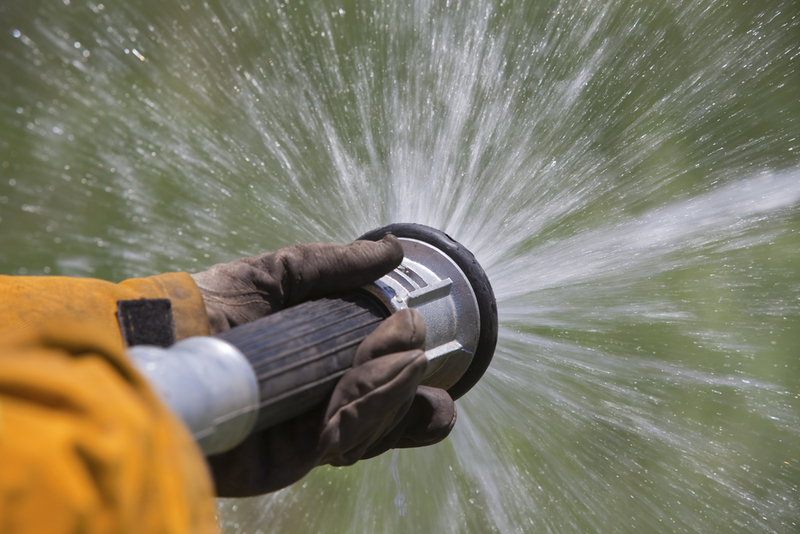 Further, many homes have insufficient water supplies available for fire fighting, and water pumps that are dependent of mains power which is likely to fail in a bushfire disaster. The level of preparation of homes also influences the trigger for people to evacuate their homes. Under Catastrophic fire conditions all residents in fire prone areas are advised to leave hours before any threat and be prepared to remain away for up to 24 hours. This is because under these conditions the risk to life is so great given the destructive potential of bushfires and their unpredictability. Another reason to evacuate early is because strong winds present the additional hazard of fallen trees blocking escapes routes. 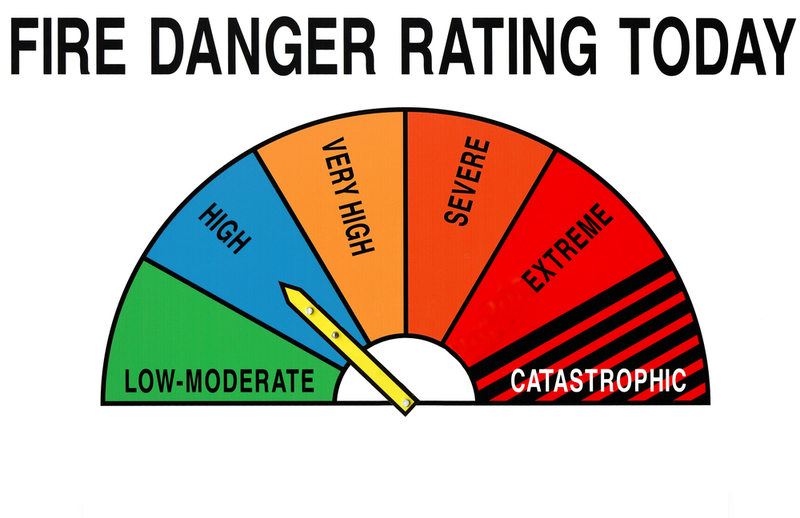 Dangerous but less destructive bushfires (during the Extreme, Severe and Very High fire danger categories) also demand residents decide whether to attempt to defend their property or leave. These decision points are context specific and hinge of the mental and physical capacities of residents and how well their defendable spaces and structures have been prepared. Where there has been no preparation the advice is to leave early. The question of exactly when to leave is also context specific. Because of the unpredictability of bushfires and their potentially rapid escalation there is a real chance that official warnings may not be provided at all, or provided just before a bushfire is threatening a residential area when it is too dangerous to leave. For this reason the guidelines highlight the need for residents to have high levels of situational awareness during the bushfire using a wide variety of information (website, media) and cues (smell of smoke, strong winds and high temperatures). Therefore residents need to make there own informed decision about when it is safe to leave. One consequence of this is that it is likely residents of fire prone areas will need to accept "false alarms" several times each summer. This could involve staying away from their homes for up to 24 hours at a time regardless of whether a bushfire starts in their community. Fire agencies appreciate the challenge of getting community traction on the bushfire threat, and are deploying diverse strategies and technologies to up skill the community and prod people into action. Nonetheless it is clear that Australians are lagging in the necessary preparations during this current bushfire season. I suspect the disconnection between the official advice and the on ground implementation results from a combination of time pressure, economic costs, misjudging the threat, and a naïve belief it will work out. One solution may be to introduced training for people living in bushfire-prone areas to help them work through the decision-making process inherent in prepare-act-survive policies. Ultimately if bushfire weather conditions continue to deteriorate under climate change it may be necessary to introduce licenses for people living in fire-prone landscapes, much as we would for people driving cars.